Nationality: American. Born: Emanuel Goldenberg in Bucharest, Romania, 12 December 1893; acquired U.S. citizenship papers on emigrating with his parents at age 10. Education: Attended Townsend Harris Hall High School, New York; Columbia University, New York; American Academy of Dramatic Arts, New York, 1912–13. Family: Married 1) Gladys Lloyd, 1927 (divorced 1956), son: Emanuel; 2) Jane Adler, 1958. Career: 1913—member of Binghamton Stock Company, New York; 1915—Broadway debut in Under Fire ; served in the U.S. Navy during World War I; 1923—film debut in The Bright Shawl ; 1927—leading role in stage play The Racket (also co-wrote it); 1931—contract with Warner Brothers; 1937–40—in radio series Big Town with Claire Trevor; 1946—formed Film Guild Corporation production company; 1956—on Broadway in Middle of the Night . Awards: Best Actor, Cannes Festival, for House of Strangers , 1949; Special Academy Award, 1972 (awarded posthumously). Died: 26 January 1973. All My Yesterdays , with Leonard Spigelgass, New York, 1973. Lee, Raymond, and B. C. Van Hecke, Gangster and Hoodlums: The Underworld in Cinema , foreword by Edward G. Robinson, New York, 1971. Wallis, Hal, and Charles Higham, Starmaker , New York, 1980. Gansberg, Alan L., Little Caesar: A Biography of Edward G. Robinson , Sevenoaks, Kent, 1983. Neibaur, James L., Tough Guy: The American Movie Macho , Jefferson, North Carolina, 1989. Marill, Alvin H., The Complete Films of Edward G. Robinson , Secaucus, New Jersey, 1990. McCarty, John, Hollywood Gangland , New York, 1995. Beylie, Claude, "Ave, Little Caesar!" in Ecran (Paris), March 1973. Overbey, D., "Edward G. Robinson," in Take One (Montreal), May 1978. Frank, Michael, "Edward G. Robinson: Sterling Collection for the Star of Little Ceasar and Double Indemnity ," in Architectural Digest (Los Angeles), April 1990. Niderost, Eric, "Edward G. Robinson: the Classic Gangster," in Classic Images (Muscatine), May 1993. Phelps, Donald, "On the Spot," in Film Comment (New York), March-April 1996. His craggy frog-face, squat, stocky figure, and whine/growl of a voice made Edward G. Robinson the permanent property of generations of impressionists and caricaturists. That his acting never descended into the masochistic self-parody of many another distinctive talent is due to Robinson's skill and humor. He became famous through his startling and vivid portrayal of Rico Bandello in Little Caesar . This and other roles of the same vintage and mood ( The Hole in the Wall and Outside the Law , to name but two) swiftly typed Robinson as a conscienceless, snarling thug. He was never trapped by this menacing persona. Instead, he played with it, using it as a foundation and weaving skillful variations on the public's perception of his range. Like Cagney he transcended typecasting; rather, he used it to his own ends. No matter with what preconceptions one approaches a Robinson characterization, the actor is able to bring to his work a freshness, an element of the unexpected. Robinson's roles were sometimes thinly scripted but they inevitably emerged as full-blooded and emotionally shaded on the screen. Even the toughest of his maniacal killers is capable of moments of whimsy or unguarded pleasure. This often points to an essential weakness in the character which leads to his inevitable downfall. This is the key to Robinson's screen gangsters and bad guys, and what separates them from those of his fellow kings of the celluloid underworld, Cagney and Bogart. Robinson's characters are killers, but they are not clever, homicidal crazies (like Cagney's) or desperate loners looking for a way out (like Bogart's). They are fools guided by stupidity—essentially comic figures. This may be why many of Robinson's best gangster films following Little Caesar were, in fact, outright comedies in which he not only poked fun at the distinctive tough guy character he had created but further defined that character in ways that some of his dramas failed to do. In these comic films, such as The Little Giant , The Whole Town's Talking , A Slight Case of Murder , Brother Orchid , and so on, his cruel face softened and relaxed until it resembled that of an amiable, if unfortunate, baby. In Robinson's best performances, he was able to walk the line between reason and rage. Flesh and Fantasy and The Night Has a Thousand Eyes show his vulnerability and susceptibility to madness; he is a hard-edged thug with a soft spot in The Last Gangster , a cuckold in Manpower , noble and tenacious in Dr. Ehrlich's Magic Bullet , shrewd and bemused in Double Indemnity , benevolent and fatherly in Our Vines Have Tender Grapes . Robinson worked with some of the best directors in Hollywood—Browning, LeRoy, Wellman, Ford, Hawks, Farrow, Curtiz, Huston—but the archetypical Robinson roles are contained in Fritz Lang's Scarlet Street and The Woman in the Window . In the former, he is an easily manipulated artist driven to madness and murder by his wife's infidelity. In the latter, he portrays a cultured and intelligent professor who becomes embroiled in the seamier side of life by his obsession with the beautiful subject of a portrait. In both films, Lang's themes seem tailor-made to display the disparate facets of Robinson's personality: paranoia, impending insanity, and violence versus taste, trust, and an innate, if fragile, amiability. 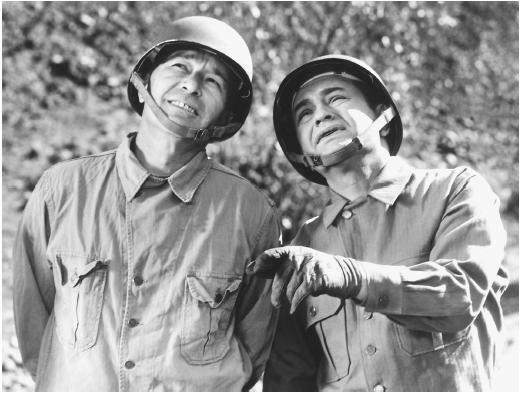 You say that the man in the picture with Edward G. Robinson (in Mr. Winkle Goes to War) is Robert Mitchum. I'm sorry, but the man in the picture is Robert Armstrong, who played "Tinker". Robert Mitchum did play a bit part in this movie, but this was at the beginning of his acting career, and the part was so small as to be uncredited. Unfortunately, Robinson and Mitchum never worked together again.